What’s under your metal roof matters. Roof underlayment is the first layer of material laid prior to the metal roofing panels. It separates the roof covering from the roof deck, thus protecting it from detrimental resins, unevenness and—in re-roofing applications—fasteners and other old building materials. This water-shedding layer also provides secondary protection from weather, shields the roof deck during construction and is often required for warranty adherence and for roofs that must meet Underwriter’s Laboratory (UL) fire ratings. Outside of its traditional use, Synthetic Underlayment can also offer a myriad of benefits to distributors, installers and homeowners alike. Felt underlayment, also known as “felt paper” has been the traditional underlayment of choice for decades. Its use was a solution to prevent damage to the roof covering caused by sap leaking out of wooden building materials, however—as even most wood structures are now constructed using plywood or other, non-wood materials—this is no longer an issue. Felt underlayment is saturated with asphalt (residue left over from the crude oil refining process) composed of volatile compounds that will dissipate over time, making it more fragile and likely to absorb moisture, further weakening the roof. This deterioration is accelerated when asphalt is exposed to UV rays and heat caused by warm climates, poor ventilation and less energy-efficient roof coverings. Additionally, advances in crude oil refining techniques now extract the maximum amount of product from the crude resource, resulting in a powder-like residue not conducive to the development of asphalt. The result is fewer raw materials to create the asphalt used in felt underlayment and more people turning to a synthetic alternative for a longer-lasting, economically efficient solution. Compared to traditional organic felt, synthetic underlayment is significantly more lightweight, permitting many more squares per roll, which can be an economical benefit to wholesalers, shippers and installers. While non-woven materials are generally moisture permeable, woven scrim synthetic roof underlayment greatly enhances tear resistance and ease of installation. While they can be designed to be moisture-permeable, synthetic underlayment is typically manufactured as a barrier that doesn’t absorb moisture, making it resistant to fungal growth and wrinkling. Of particular importance to the roofing industry are the IRC and IBC I-Codes. These codes include specific underlayment requirements and installation/ attachment directions for simple enforcement by inspectors. Provided in Chapter 9 of the 2015 IRC and Chapter 15 of the IBC, they cover material types, application and attachment requirements, including specific information for metal panels with denotations included for variances specific to high-wind areas. Because of the wide variety of underlayment and metal panel styles, the IRC and IBC require installation according to manufacturer’s instructions. In the absence of manufacturers’ instructions and/ or when using alternative materials, the specific requirements outlined in the IRC and IBC I-Codes should be used where applicable. Remember, a metal roof is designed to have a long service life, and the underlayment’s service life should at least match that of the metal roof. Don’t be shortsighted when designing for longevity by using an underlayment not guaranteed to last for the duration of your roof. Woven, coated polypropylene synthetic underlayment fabric is not only designed to protect against weather damage, but also provides greater strength, a longer UV exposure window and more secure surface for installation safety. Some underlayment options are 100 percent recyclable and up to 25 degrees cooler than asphalt felt, which can result in decreasing energy costs for the consumer. At one-fourth the weight of traditional felt, but up to 20 times stronger, it ensures longevity that can’t be matched using traditional felt, particularly in areas that experience extreme heat and weather events. To prevent downhill slide during installation, underlayment is manufactured with anti-skid coating on both sides, ensuring a more sure-footed feel is achieved once attached. 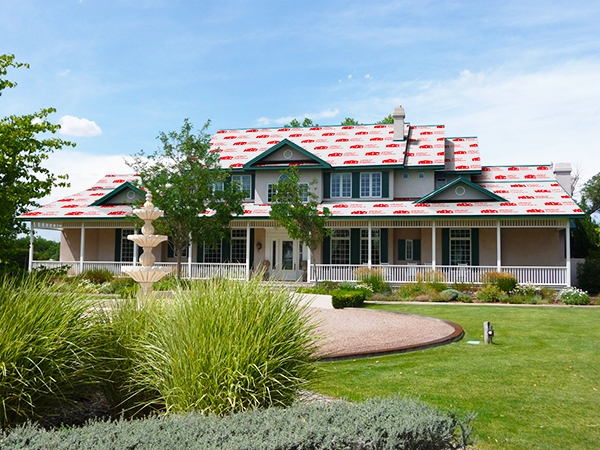 In addition, underlayment is certified to withstand up to six months of exposure to the sun and other weather elements before the final roofing material must be laid. For more information on ABC’s metal roof and wall products and for more tips on underlayment, please contact your local ABC sales representative.